In 1861, Congress instructed the Army Corps of Engineers to dispatch an Engineer Officer to Manistee to conduct a survey of the river entrance. Water depth in the opening between the piers was found to be from seven to eight feet, and a 250-foot long sand bar with a water depth of less than five feet above it was identified 600 feet off the end of the piers. 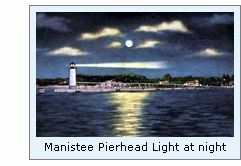 While the Engineer’s report indicated that harbor improvements at Manistee were both necessary and valid, nothing would be done until 1867 when appropriations were simultaneously approved for improvements to the river entrance and for the erection of a lighthouse to guide vessels into the new entry on its completion. A survey party was sent to Manistee in 1876 to select and survey a site on the north shore of the river mouth for the new lighthouse reservation. 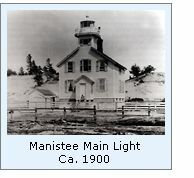 While the new Manistee Light was completed in 1870, a devastating fire swept though the area on October 6, 1871, completely destroying the to its foundation. Congress appropriated funds for the construction of a new lighthouse which was erected the following year. 1874 and 1875 were exceptionally busy years for Manistee, with 3,488, vessels entering the river between June 30, 1874, and June 30, 1875. To serve this burgeoning maritime commerce, the piers were extended an additional 150 feet in 1875, and the channel between them dredged to a minimum depth of ten feet. With the main light now standing a considerable distance to the rear of the pierheads, the decision was made to replace the shore light on the north bank with a pierhead beacon on the outer end of the longer south pier. 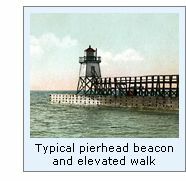 The new south pierhead light consisted of a timber-framed pyramidal beacon typical of the type being erected on pierheads throughout the Great Lakes. With its lower half open, the upper half immediately below the gallery was enclosed to provide a small service room for lamp maintenance. Equipped with windows, the service room also served as a sheltered area in which the keeper could stand watch during inclement weather. Standing 27 feet in height, the beacon was capped with a square gallery with iron handrails and an octagonal cast iron lantern installed at its center. The fixed red Fifth Order lens was removed from the main light and reinstalled in the new beacon, where its 35-foot focal plane afforded a range of visibility of 11 miles in clear weather. An elevated timber walkway lead from shore to a door in the service room, allowing the keepers to access the light in relative safety when storm-driven waves crashed across the surface of the pier. Keeper McKee rowed across the river to exhibit the new light on the night of October 15, 1875, and with the establishment of the new light, the main light was officially discontinued. While the main light no longer served as an aid to navigation, the structure continued to serve as the keeper’s dwelling, and thus the keeper was forced to row across the river numerous times during each day and night to tend the pierhead light. However, McKee’s inconvenience was short-lived, as he was removed from his position on October 26, 1875 and William King appointed as his replacement. With work continuing on the piers in 1879, the pierhead beacon was moved 156 feet to the revised end of the south pier, and the elevated walk extended to fill the resulting gap. The following year, the dwelling was thoroughly repaired, and a new well sunk to provide a supply of fresh drinking water for Keeper King and his family. Traffic in and out of the river continued to increase throughout the 1880’s. 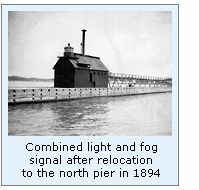 To better serve this traffic, Eleventh District Engineer Major Samuel M. Mansfield recommended an appropriation of $5,000 for the erection of a fog signal on the south pier to serve as a guide to mariners during thick or foggy weather in his report for 1888. Congress responded with the requested appropriation on March 2, 1889, and bids for furnishing the labor, construction materials and mechanical equipment were advertised and awarded that same year. The following spring, a work crew arrived at Manistee to undertake a number of improvements on the south pier. First, a tubular lantern was erected on a pole at the outer end of the newly extended south pier to serve as a front range for the pierhead beacon. The lantern was suspended from a cable which passed around a pair of pulleys, with one pulley secured to the pole at the at the pierhead, and the other inside a window installed on the lakeward side of the beacon service room. This system was designed to allow the keeper to service the tubular lantern from within the confines of the service room, and then transport the light out along the cable to the pierhead. After completion of this new light, the crew turned its attention to the erection of the new fog signal building. Typical of such structures being erected throughout the Great Lakes, the fog signal building was built on the pier immediately behind the beacon, and connected to the beacon by a short length of elevated walk. Timber-framed, and sheathed with brown-painted corrugated iron sheeting, the structure housed a pair of horizontal boilers piped to a pair of 10-ich locomotive whistles installed atop the roof. The interior of the structure was also outfitted with a coal bin, water supply tank and a work bench to give the keepers an area on which to perform maintenance on the signal equipment. Construction of the new building continued through the winter, with the signals finally tested and placed into operation on February 10, 1890. With the establishment of the new fog signal, the decision was made to add an assistant to the station’s roster, with John Langland Jr. arriving to fill the position on January 15. The volume of traffic along the coast heading to and from the Straits continued to increase, and in 1893 the decision was made to reactivate the old main light to serve double duty as both a coast light and to better guide mariners to the river mouth. The futility of having the keepers simultaneously attend the reactivated main light on the north side of the river and the fog signal and the ranges on the south pier became clear, and thus plans were also put in place to relocate the fog signal and pierhead light to the north pier at the opening of the following navigation season. In May of 1894, a work crew arrived at Manistee moved the fog signal building from the south pier to a new timber foundation that had been erected 300 feet from the outer end of the north pier. Rather than relocating the old pierhead beacon, Major Milton B. Adams instead decided to install one of his newly designed conduit systems on the north pierhead. Supported by trestles, a wooden conduit box lead from the pierhead, 290 feet to an opening in the lakeward wall of the fog signal building. The conduit contained a set of iron rails on which a steel trolley was located. The lens was mounted atop this trolley, and could be moved back and forth within the conduit from the fog signal building to the pierhead. 460 feet of new elevated walk was also installed from the rear of the fog signal building toward the shore. The old elevated walk was then removed from the south pier, and 463 feet of it reinstalled on the north pier, bringing the total length of elevated walk on the north pier to 923 feet. The old Main Light was reactivated on June 18, 1894, and the ranges on the south pier discontinued and removed. 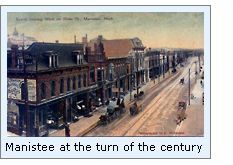 With a continuing increase in maritime commerce through the late nineties, Manistee was in a state of metamorphosis. Undergoing the inevitable "gentrification" that results from a massive influx of business people and wealth, many of the newer residents found their sensibilities insulted by the caterwauling of the fog whistle out on the north pierhead, and began raising their voices in both disgust and concern. A similar set of circumstances had unfolded previously at the Duluth South Breakwater Light in 1895, where the sound of the fog signal bounced from the hillsides around the harbor, upsetting the city residents. 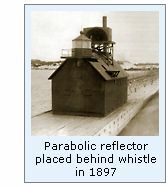 Needing the support of the local maritime community, the Lighthouse Board had undertaken an experiment whereby a large wooden parabolic reflector had been constructed around the Duluth whistles. Designed to concentrate the sound on the lake side of the whistle, while simultaneously shielding the city side from much of the noise, the experiment had been considered to be an unqualified success. Thus the decision was made to undertake a similar modification to the Manistee whistles, and a crew arrived at Manistee in 1897 and crafted a reflector framework of pine, sheathed in iron and packed with sawdust to deaden the sound. The whistles were then re-piped into the center of the reflector, and a semblance of peace restored to the citizenry of Manistee. 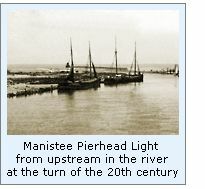 Adams’ experiment with his new conduit system proved to be less than successful, and the system at Manistee was removed from the north pierhead in 1900. At the same time, the fog signal building was moved 260 feet to a point 42 feet from the pierhead, and installed atop a two-foot high timber foundation. A gallery and octagonal cast iron lantern were then installed on the lakeward gable end of the fog signal building, and the lantern outfitted with a new fixed red Sixth Order Fresnel lens. To clear the new lantern, the fog whistle and deflector were raised by 4 feet. In 1914, the Army Corps of Engineers were again at Manistee overseeing the erection of a breakwater on the south side of the harbor. In concert with the elongated north pier, the two structures formed a large stilling basin, ensuring calm water at the channel entrance. With completion of the breakwater on April 6, 1914, a red steel skeleton tower was established 80 feet from the outer end of the breakwater. Equipped with an acetylene powered flashing red 300 mm lens standing 45 feet above the water, the 60-candlepower light was visible for 7 miles, and the Manistee keepers once again found themselves responsible for three lights and a first-class fog signal. With the availability of municipal electricity, all three lights were electrified in 1925, with a commensurate increase in both candlepower and visible range. After major improvements to both the north and south piers in 1927, the old fog signal building was removed, and replaced by a 39 foot-tall iron tower on the outer end of the south pier. Capped with a decagonal steel lantern outfitted with a Fifth Order Fresnel, the light was equipped with a 5,000 candlepower incandescent electric bulb equipped with a flashing mechanism which exhibiting a group occulting white light with a period of 30 seconds. Sitting at a focal plane of 55 feet, the new light was visible for a distance of 15 miles in clear weather conditions. A single "Type C" diaphone powered by an electric compressor was housed within the tower, and emitted a characteristic similar to the light consisting of a group of three blasts every 30 seconds. With the erection of this new tower, the old wooden elevated walk was torn down, and replaced by a cast iron walkway. The city of Manistee has done an incredible job of downtown restoration, and has aptly earned the nickname of "Lake Michigan’s Victorian Port City." The downtown shopping district has been restored, and walkways along the river banks lead down to the lakeshore where the 1927 north pierhead light and elevated walkway still stand guard over the harbor entrance.